You can put it where you want, you only need a EU SCHUKO socket. Allows to receive the NOTICES of intrusion ONLY WHEN THE SYSTEM IS ARMED. 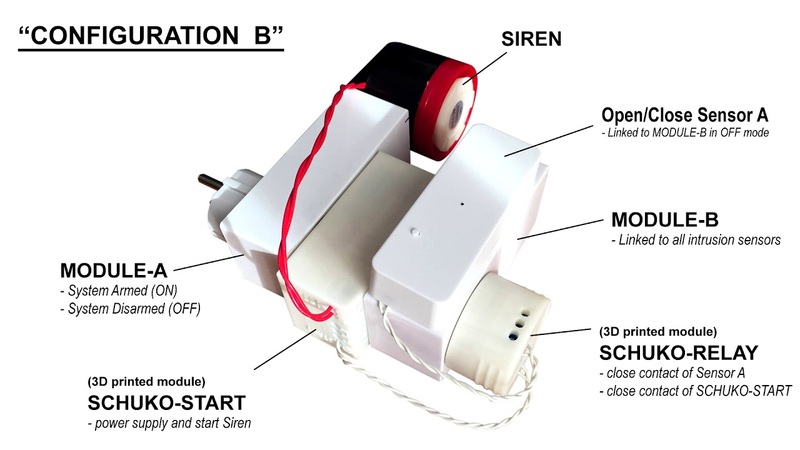 The return to the OFF state of MODULE-B can be executed with a simple internal modify (bringing out the 2 contacts of the OFF button) or without modify, with a "Open/Close Sensor"
Alarm Unit can be armed/disarmed manually (with remote control or smartphone) or automaticaly (with custom scenes or from particular states of other devices), simply setting the MODULE-A in ON-state (System armed) or OFF-state (System disarmed).